The nationalist right in France is seeking an alliance with a similar Dutch party, AFP reports. French far-right leader Marine Le Pen wants to campaign with Dutch anti-Islamic party leader Geert Wilders in next year's European parliamentary elections, she said in an interview Saturday. "We could perhaps campaign together for the elections," Le Pen told Dutch daily NRC Handelsblad. "It's important that the voter sees that we do not stand alone, that similar patriotic movements are active in every EU country," she said. Le Pen said earlier this year that she wants to begin a pan-European far-right parliamentary grouping, including her National Front (FN) party, after the May 2014 European elections. Wilders' Party for Freedom (PVV) lost out in a Dutch general election in September 2012, with its seats almost halved to 13, but the party has been riding high in opinion polls, largely thanks to anti-EU policies. protectionism, but Wilders reportedly wanted to keep his distance because of the anti-Semitism of Le Pen's father and the founder of the FN, Jean-Marie Le Pen. Marine Le Pen, currently an MEP, and Wilders had lunch in Paris in April, but a date wasn't set for her to visit The Hague, the NRC newspaper paper said. "The current system has a lot to lose if our movements work together," Le Pen said. "We must not fall into the trap of demonising each other, that's just what the established parties want. I think Wilders is intelligent enough to understand that." "Don't forget that Wilders and I have a different history and we work in different contexts." Le Pen said that she was "perhaps less radical" than Wilders concerning Islam. While she fights against Islam's presence in public life in France, "I have nothing against Islam in itself," she said. "I don't think that Islam is by definition incompatible with democracy." She has been criticized for comparing the influence of Islam in France to the Nazi occupation, and for calling to ban the kippah (yalmulkah) along with the Muslim veil. 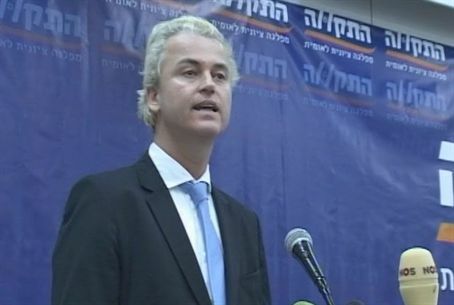 Wilders has openly criticized Islam as a faith. Despite his support for Israel he, too, has faced criticism from Jewish groups; in his case, for supporting a ban on Jewish and Muslim methods of slaughtering livestock.